The first time I saw Dragon's Dogma, I thought that the creators of the recent Devil May Cry sequels were making a mash-up of God of War and The Elder Scrolls. And I thought that that was a bad idea, a bad use of the labor of the largest development team to ever create a game for Capcom. The first time I played Dragon's Dogma, about four or five hours after I first saw it, weathering the dreary slowdown of a brief, rough demo, I discovered a game that feels fresh, that feels like a wonderful risk. The game's top creators call it, "the greatest action game we've ever made" and "the type of game I've been wanting to make since I was in junior high." It felt to me like the game that could make me feel like a great warrior-boss, the leader of a sword-and-sorcery fellowship, the captain of a crew of Dungeons and Dragons heroes, a man whose minions can help him topple great mythological beasts. 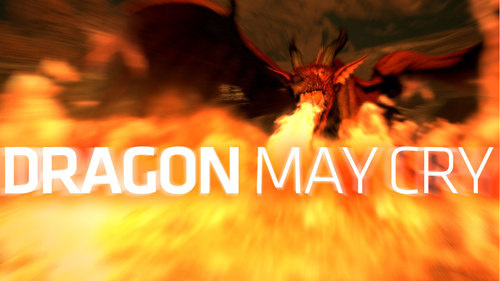 Dragon's Dogma is an early 2012 epic from director Hideaki Itsuno and producer Jiroyuki Kobayashi, who both led development on Devil May Cry 3 and 4. They've been planning the game for three years, making it for the last two, trying to create an open-world action game that Kobayashi believes is the best action game Capcom has ever created. Capcom set up a countdown clock for the game last week, a clock that counts down to today. But last week in Miami Kobayashi and Itsuno were already showing the game in advance to reporters like me, who had to hold our impressions until now. Their new game puts players in control of a male or female medieval hero who can be a strider, mage or fighter. The strider, who we were shown and who I later played, uses daggers for close combat and arrows at range. The hero gets four party members, all computer-controlled, who go to battle with him. Their adventure occurs in the rolling hills and amid the grand castles of a fantasy world full of ogres, dragons and cities full of merchants. At the beginning of the game, a dragon is reborn and forms some sort of bond with the lead character. That dragon is "whispering to his heart," Itsuno said through a translator, "'I need you to come to me. I need your services.'" "[This is] the type of game I've been wanting to make since I was in junior high." We didn't see the dragon in the interactive part of Dragon's Dogma on display in Miami. We got to see a fight against a griffin, a massive lion with the head and wings of an eagle. First, I saw the developers fight it. They started out in the countryside, briskly using their hero to kill a bunch of human-sized ogre enemies before the griffin swooped in for an attack. Kobayashi is right to call this an action game and downplay any visual similarity it may have to fantasy role-playing games such as Oblivion. There is no evident math to the combat; it's all real-time swinging of sword, aiming of bow and casting of spells. You have heavy and light attacks and a grab move good for restraining an enemy or climbing onto a giant beast in order to crawl over it stab its weakest spots. The longer you prepare your attacks and spells, the more potent they are, he explained. Each character has special moves, such as the archer's charged arrow shot and his or her ability to rain arrows on one spot a few yards ahead. So in this one Dragon's Dogma fight shown in Miami, the strider hero, aided by a trio of computer-controlled minions, or "pawns," fought as a crew. The mage set up a healing spell limited to those standing inside a ring of magic encircling him. One of the other minions lifted an ogre enemy's carcass to use it as bait for the griffin. "Don't let them surround you." "Slay them one by one!" "I'll aim for its wings." "I'll aid you at once." It was at the moment when I completed those notes that my optimism for this game reached its nadir. I would have to play that griffin battle to understand its potential. When you're in control, the pawns' words are annoying — due to be dialed back, a Capcom rep said — but they are also helpful. The fight against the ogres, which turns into the fight against the griffin is hectic. There are ogres everywhere and your allies, as best they can, are trying to help set up the best strategies to win the fight. The shouting mage is alerting you that he just cast a healing spell and that you can rush to him for a recharge. The pawn yelling that you should "aim for their backs" is wrestling with an ogre and ready for you to rush up behind and level a killing blow. The sense I got was that this was my team, that these people worked for me and were doing their best to support me to victory. They identified the griffin's weakness — its wings — and then started trying to toss fire at it. They held up an ogre body to draw the griffin to them. One of the pawns crouched down and exhorted me to run to her so she could launch me in the air, and, at the height of my jump, I just barely missed grabbing the griffin's foot. It would have been great if I did. I envy the millions of people in Japan who enjoy Monster Hunter. These people know the pleasure of teaming up with just a few friends to slay a big monster. 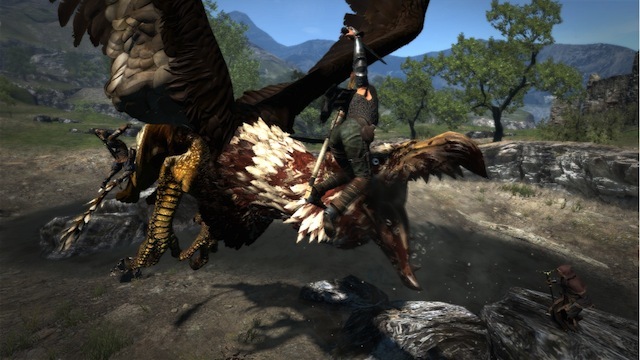 It struck me that the griffin battle in Dragon's Dogma was a single-player simulation of that. It's faster paced than a Monster Hunter, but it is designed to evoke the same thrill of a band of heroes slaying a larger foe. The game isn't all monster-fighting. We're not always tackling the biggest beasts. Itsuno told me that the pawn system is the biggest new thing in Dragon's Dogma. It's a more complex element than simply having a trio of partner characters. You can recruit the best ones from town and send them on missions to gather intelligence, affecting what you'll know. They're also the feature I'm most optimistic about. They declined to say how, if at all, the pawn system will support multiplayer, but it doesn't appear that players can band together in Dragon's Dogma for co-op. Itsuno promised some other "spin" on multiplayer. 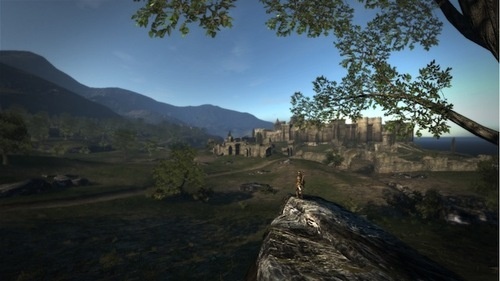 Dragon's Dogma includes more conventional elements. It has a town full of up to 200 non-player characters, some of whom will improve your weapons or revive your health. Beyond the town the game is supposed to be open-world, which means that just as you run your way to one mission you may be distracted by an enemy attack on some other town and run to it to be the savior there instead. The game's got a day-night cycle, with new enemies showing up when it gets dark. I'm not sure how grand the game will actually be. The developers boasted that any place you see on the game world's horizon is a place you can visit, but when they zoomed out above the game's castle town, for example, it appeared to be maybe twice as big as Ezio's villa in Assassin's Creed II, the full game world we were shown grander than that but not, say, as vast as the terrain of Red Dead Redemption. While many action games are about being a hero or anti-hero, Dragon's Dogma appears to be a stab at creating a game that lets the player feel like a leader. It doesn't seem like it's intended to make us feel like a king but rather like the best knight in a band of chatty monster-slayers. That's an experience worth watching develop, especially if it's the biggest game Capcom's ever made. Wait longer for the reinvention of the Devil May Cry series in the form of the game DMC. But wait only until the end of the month to see 2008's Devil May Cry 4 turned into an iPhone game. Website Slide To Play says the game, Devil May Cry 4 Refrain, will have 10 levels, cost $6.99 and will be out this month. It'll star Nero when it comes out on the App Store, but the other DMC4 protagonist, Dante, will be added at a later date. The console game was a full-scale 3D action adventure with constant, crazy combat. The iPhone version is simpler in presentation, as you might expect, though it's designed to imitate the controls of a device other than the iPhone via a virtual analog stick and four "buttons." Watch the video to see how the game plays. It sure sounds like the game has the kind of metal soundtrack that helped give DMC4 its hell-raising style.